In this short video, the Vicar talks about some of the history of St Mary’s. This is a shorter version of a film made for St Mary’s by Epsom Moviemakers. The date on which a church was first built in Ewell has not yet been established, but historians think it likely that there was one from early, possibly Saxon, times. Admittedly, Domesday Book (1086), William the Conqueror’s overview of the resources of his kingdom, does not record a church in Ewell. Those compiling the entry for Ewell stated “The church in Leatherhead is attached to the manor” (i.e. 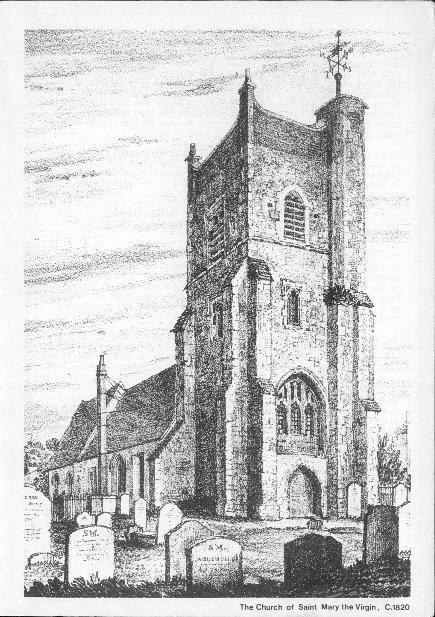 of Ewell), possibly because this church was on land belonging to the manor of Ewell. They also credited Epsom with two churches but, so far, the second one has not been identified. Historians have put forward the idea that it was almost certainly identifiable with a church in Ewell (c.f. Introduction to “Fitznells Cartulary”, ed. C.A.F. Meekings and Philip Shearman, Surrey Record Society Vol. XXVI, 1968; and “Early Medieval Surrey: Landholding, Church and Settlement before 1300”, John Blair, 1991). The earliest written date so far discovered for a Vicar of Ewell occurs in the Fitznells Cartulary in the reference made to William de Alezun, Vicar of Ewell, in 1194. What happened between then and 1239 when Robert de Anketil’s name appears as Vicar of Ewell has yet to be discovered. The board over the South Door of the present church gives names and dates, until 1381, of curates providing occasional services. The record starts again in 1458, by which time the advowson had passed to the Prior of Newark (near Pyrford, Surrey) and, in the time of William of Waynflete, Bishop of Winchester (Ewell being then in the diocese of Winchester), the endowment of a perpetual vicar was made. From 1458 onwards, the advowson was exercised by several patrons until, in the mid-eighteenth century, it came to the Glyn family (see below). After the death in 1946 of the last of the Glyns of Ewell, Miss Margaret Glyn, the next incumbent was appointed by Mrs. J. Foubister, who then transferred the advowson to the Bishop of Guildford. The previous Vicar was appointed by the Crown because the diocese of Guildford was vacant. There is a substantial amount of information about the appearance of the old church. In “History and Antiquities of the County of Surrey”, Vol. 1 (1804), Manning and Bray give a detailed description. Paintings, for example by Holman Hunt and G.M. Waghorn, illustrate the appearance of the exterior. It was built of flints with chalk, with Reigate stone facings, and measured 96′ feet long by 31′ 3″ wide. It consisted of a nave, chancel and south aisle leading to a chantry chapel built by Sir Richard Bray, who died in 1559. There was also a porch and two galleries. A tower dated to the fifteenth century, and built of the same materials, was added later and heightened even later by a brick parapet. All that remains of the old church is this tower (a scheduled ancient monument), which has been repaired and maintained by the efforts of the Ewell Tower Preservation Trust, which opens it occasionally so that the public can see what is thought to be the oldest building in Ewell. When the old church was demolished, some of the fittings and monuments were saved and transferred to the new church. The incumbency of the Rev. George Glyn, who became the fourth baronet in 1840, opened a new era in the history of St. Mary’s. He found the old church in a sad state of dilapidation and disrepair. Sir George gave land and £500 towards the cost of building a new church, employing as architect Henry Clutton of Whitehall. The foundation stone of “this handsome edifice”, to quote from a newspaper cutting, was laid on 26 June 1847. The main features of the plan for the new church were: a nave 66′ long and 24′ wide; a chancel 29′ and 24′ wide; north and south aisles 12′ wide (the north aisle being widened later); and a tower, on the western end of the north aisle, 88′ high to the top of its pinnacles. At the time of building (1847-48), it had a south porch as its main entrance, but, in 1908, a west porch was added. The exterior of the church was faced with Swanage stone, quoins and ornamental features being worked in Bath stone. The roofs were covered with plain tiles with slightly ornamented cresting. When this description was published, the estimated cost was given as “more than £5,000, £1,000 being raised by the parish rate; and the remainder by subscription and with aid from Church Building Societies”. The parishioners then set about embellishing the interior of the new church. Fittings and monuments from the old church were installed. They included the handsome tomb of Sir William Lewen, Lord Mayor of London in 1717 who bought property in Ewell, inherited by his great-niece who married into the Glyn family; a communion table (1612), sixteenth century brasses, a ring of six bells, and a clock dated 1799. The fifteenth century rood screen was extended to fit the opening of the chancel in the new church, which is wider than the chancel in the old church. During the second half of the nineteenth century, beautiful replacements and additions were made to the interior. 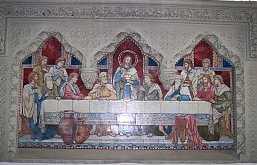 Installed in 1883 was a reredos in fine Victorian craftsmanship depicting the Last Supper, with side panels containing figures of the four evangelists: Matthew, Mark, Luke and John. In 1897, Mr. and Mrs. Edward Martin replaced the wooden, Tudor pulpit with one carved in marble and alabaster, dedicated “to the glory of God and in memory of their son and daughter”. In 1890-92, the six bells from the old church were re-cast and two new tenor bells added; and a new oak frame constructed to hold the eight bells. Also donated during this period were stained glass windows of which one remains, the fine west window illustrating the Presentation of Christ at the temple – the Candlemas story. This was given by Augustus Gadesden of Ewell Castle in memory of his wife, Emma. 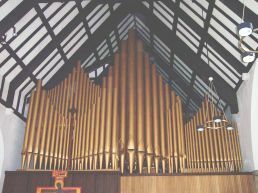 In 1865, St. Mary’s acquired an organ built by “Father” Henry Willis, considered to be the greatest organ builder of the nineteenth century. Following tradition, the walls of St. Mary’s were adorned with tablets and monuments (a source of history in themselves) commemorating members of local families, both gentry such as the Glyn family whose tablets dominate the chancel, and servants of the church and the village community such as George Scowen, parish clerk and verger; and Elizabeth Deavin, schoolmistress. The Charities Board on the wall of the north aisle testifies to the generosity of the donors. In the autumn of 1894, a church hall was built, adding to the amenities offered by the church and providing evidence of its care for the congregation. During the twentieth century, notable gifts and events earned their own place in the history of St. Mary’s. In 1908, Mr. W. Martin paid for the erection of the West Porch, dedicated to the memory of his wife, Jessy, his co-donor of the pulpit in 1897. In 1913, the sixteenth century brasses were grouped and mounted in the south-west corner of the church, displayed to pleasing effect after a visit by Mill Stephenson, author of “A list of monumental brasses in Surrey” (1921, re-printed in 1970). The years 1914-18 during World War I appear to have been uneventful so far as the building was concerned but an indication of St. Mary’s continuing role in the community may be found in the introduction of the “noon bell”. According to the Parish News, parishioners, when they heard it toll, were asked to “pray for King and Country”. A milestone in the history of St. Mary’s was the year 1927 when much of Surrey, including Ewell, was transferred to the diocese of Guildford. The years of World War II do not produce much information about the fabric of St. Mary’s, save that the East Window was damaged but was replaced in 1947 by a fine window, designed by James Hogan, with, as its centrepiece, the Blessed Virgin Mary and Child, flanked by panels depicting St.Peter, St. Paul, St. Michael and St. John the Baptist. In the post-war period, the recurrent theme centred on appeals for funds to maintain and repair the fabric, notably in 1948 during the centenary celebrations of St. Mary’s consecration. In the early 1970s, much work was nearing completion when a disastrous fire damaged the north aisle and destroyed the greatly valued Father Willis organ, a bitter blow to St. Mary’s with its strong musical tradition. Services were continued, firstly in the church hall and then in the United Reformed Church; emergency repairs then enabled a truncated church minus the north aisle to be used until restoration was completed. 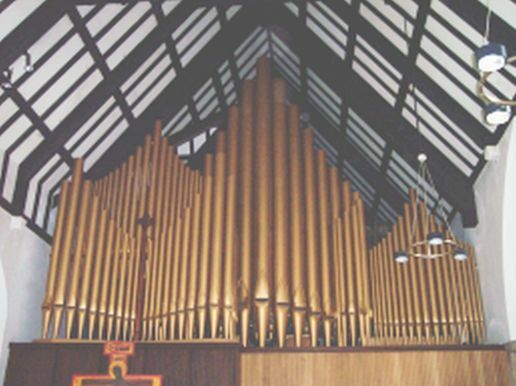 By good fortune, St. Mary’s was able to purchase another Father Willis organ from a church in Highgate. In 1975, the striking Fire Memorial Window, designed by Laurence Lee, replaced a damaged window in the north aisle; and two tablets commemorating the fire were also put up in the church. During the last years of the twentieth century, the interior of the church was re-planned, largely by the removal of some of the wooden pews to give space at the west end for a Welcome Area, and at the front of the church where the nave leads to the chancel. The twenty-first century has opened with the installation, on the south wall, of a superb stained glass window commemorating the fiftieth year of the reign of Her Majesty Queen Elizabeth II and the Millennium 2000. 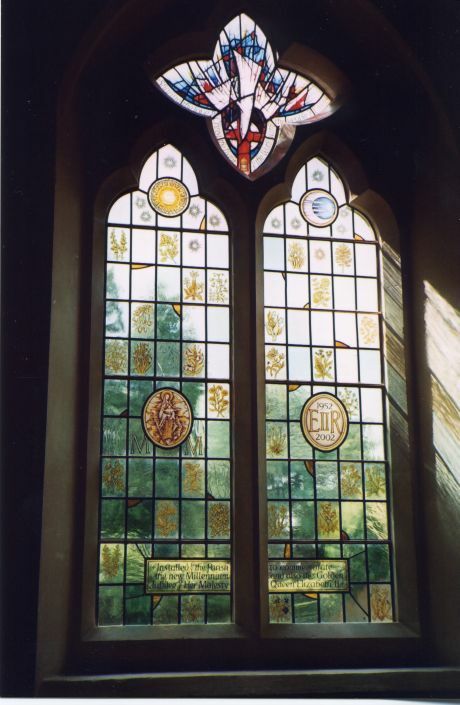 Designed by Alan Younger, the window was funded by private subscription and, on Palm Sunday 2003, was blessed by the Bishop of Guildford, who also blessed a Garden of Remembrance in the churchyard. This window completes a quartet of beautiful stained glass windows. A guidebook, written for the 150th anniversary of the ‘new’ church, is available for anyone who would like to visit St. Mary’s and see more of the interior. It costs £2.50 + 50p postage. There are several churchyards adjoining the church and there is an excellent book about the old churchyard by Maurice Exwood, who described in detail graves and monuments, and supplied names and charts of those interred. It is understood to be out of print, but copies should be available in public libraries. Sharing the love of Christ, the Light of the World, with the people of Ewell.